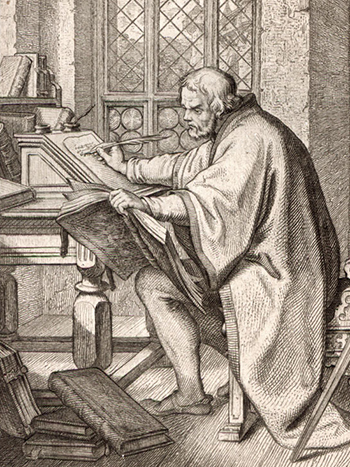 Martin Luther writing in the Wartburg. Luther’s Large Catechism, or German Catechism, is meant to be a basic instruction to Christians in the fundamental parts of Christian faith, containing “what every Christian should know.” These parts include the Ten Commandments, the Creed, the Lord’s Prayer, and a treatise, both on Holy Baptism and the Sacrament of the Altar. According to Luther’s first preface, it is designed as a handbook to the heads of the households to help them teach their families and household. The second preface directs it more to preachers and pastors, providing them a model for Christian education. The Large Catechism was formulated alongside the Small Catechism, and in a way, can be read as the basic draft to this most successful booklet ever of the reformation era. As in the Small Catechism, Luther treated the basic texts of Christian teaching in the tradition of the medieval church, adding two parts: Holy Baptism and the Sacrament of the Altar. The work resulted from three series’ of sermons Luther preached in 1528. For several months that year, Luther replaced John Bugenhagen, the local pastor and superintendent in Wittenberg. He began writing in September 1528, but in January 1529 became ill and resumed his work in March. By mid-April 1529 the Large Catechism was published. The “Brief Exhortation to Confession” was inserted in the 1529 revised edition. According to the Binding Summary of the Formula of Concord (1577), the Large Catechism summarizes Christian teaching as a “Bible of the Laity.” The five parts of this work, linked by the principle of God’s self-donation willing to communicate His salvation to all humankind, are meant to effectively introduce a fundamental summation of the Christian life, even on a daily basis. With this perspective in mind, the Large Catechism can serve as an exemplary piece of Christian education, motivating us to live our Christian life in the light of the Gospel as rediscovered in the Lutheran reformation. You can read an older translation of the Large Catechism online here for free. For an up to date translation that’s easy to read, check out The Book of Concord – A Reader’s Edition from Concordia Publishing House.